We sh...err, kid, you not. I mean, talk about taking a real crapshoot with a product. It's not the first time that Big Joe has gambled big and sent us a product to sample and grade before hitting the markets...athough those salmon muffins didn't work due to spontaneous human combustion concerns, and that people food product last year just didn't get enough people's tails wagging, apparently. Not every product can create a splash. 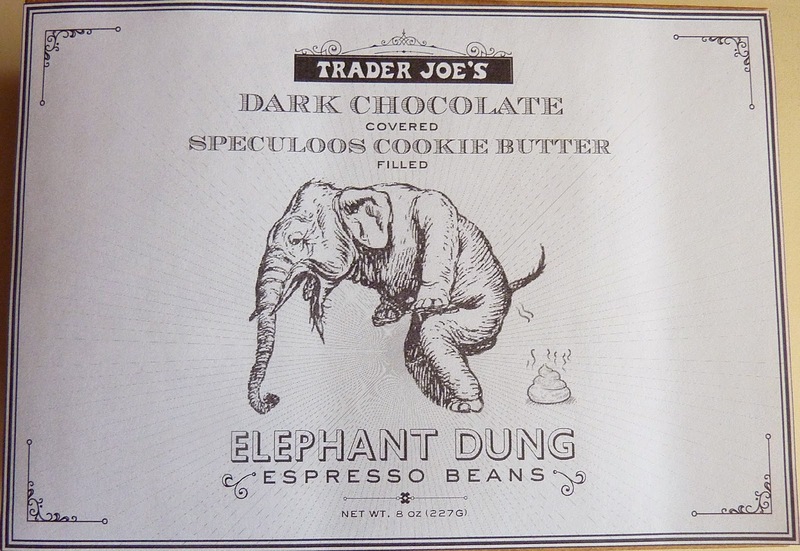 Well, here's one that really pushes it to a new extreme: Trader Joe's Dark Chocolate Covered Speculoos Cookie Butter Filled Elephant Dung Espresso Beans. Read it over again. Okay, okay, okay. Don't poop yourself out over this. Relax. And allow us to drop these info nuggets on you. Coffee beans and elephant dung are an actual thing. It's called Black Ivory Coffee, which, according to this article, is the world's most expensive coffee at north of $70 a cup. Apparently, the pachydermal digestive process sweetens the natural bitterness of coffee through some type of fermentation process that heightens the natural sugars within the bean itself. Interesting. And apparently pretty tasty. That's all well and good, you say, but those coffee beans get cleaned up before making their way to the roaster. This is something else entirely. Well, we're trusting this isn't a load of bull, but we've heard that apparently there was an incident one day at the elephant reservation/coffee plantation that involved a cookie butter tanker being stampeded, overturned, and emptied by a herd of hangry over-caffeinated mastodons. The result? A day long bingefest on cookie butter, with only an occasional coffee break. Or, as we would probably call it, heaven. Now, when the time came to collect the passed coffee beans, one of the workers noticed that there was a very distinct aroma that was not the usual brand wafting around. It smelled...speculoosy. Even...gulp...deliciously speculoosy. He then had the brilliant insight that whatever goes in would be exactly what came out, and if the elephants had had only coffee beans and cookie butter, well...Out of the most daring taste test of all time, we now have these pootie pellets, only covered with dark chocolate to literally help sugarcoat the whole experience. Tastes like the bomb. You have good, kinda fruity, sweet coffee beans. There's the cookie butter, um, "filling" that tastes a lot like cookie butter, just a tad earthier and nuttier. 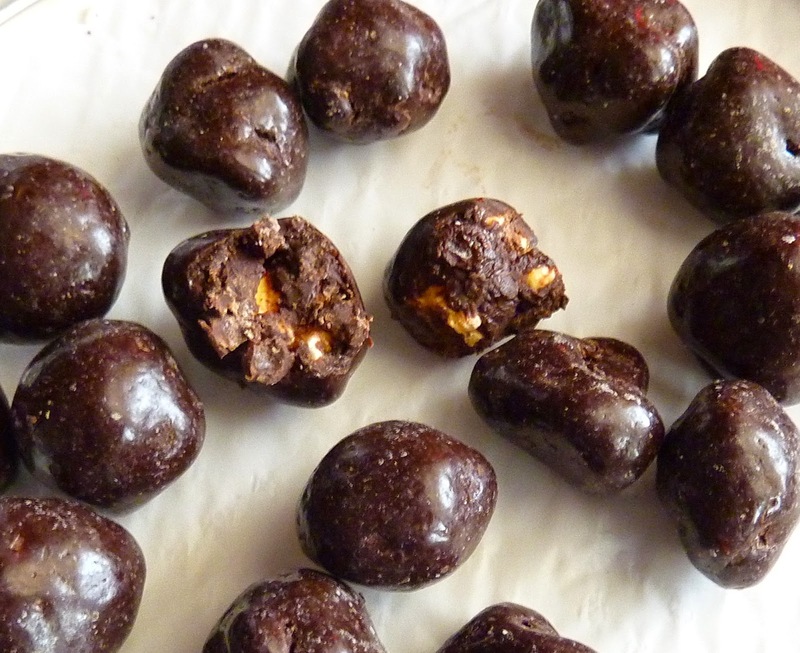 And the dark chocolate helps bind it all together and serves as a remarkably convincing textural deceiver. There's no exact explanation for it all - just dare yourself and plop one in. You'll be well relieved afterwards, trust me. Despite my initial hesitation, I'm glad I've decided to endure the manure and give these bowel-y bonbons a try. I mean, now we have definitive proof that cookie butter will make anything taste good. 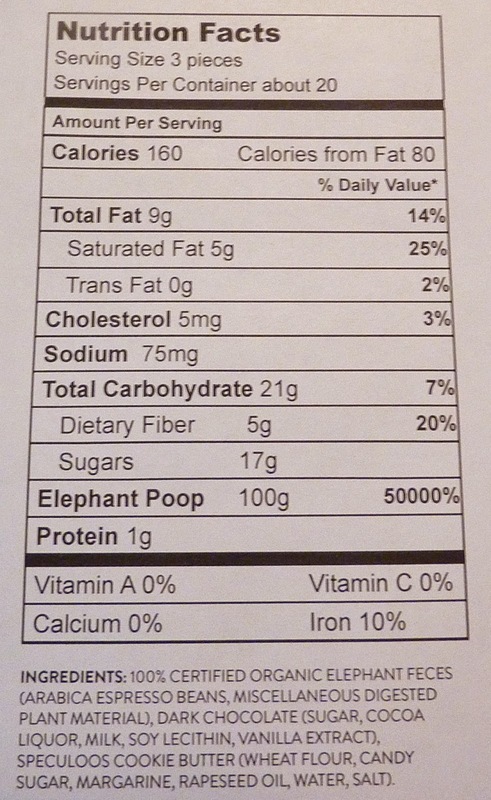 Next time someone tells me to go eat poop, well, I've got my go-to poo-poo. Literally. A five. Sandy, although she likes them, still can't quite get over the whole concept, and can give them nothing more than a solid number 2. We expect nothing less from TJ's! Nice April Fools post! Good job. If they actually rolled out that I'm sure there will be complaints about the name.